term for off dry wine with between 8 and 15 grammes of residual sugar. 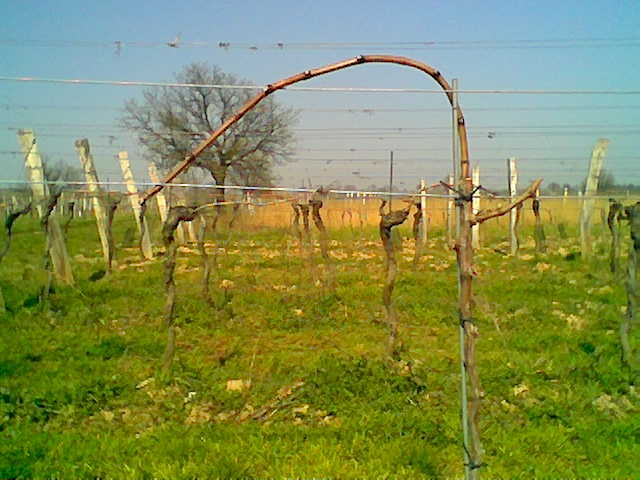 A German training system whereby the vine is pruned to one cane of about 15 buds' length, and is arched in the middle over a wire about 25 cm/10 in above the base and end of the cane. Shoots are trained each year vertically between foliage wires, and are trimmed at the top. Tasting term describing a wine which is excessively tannic, bitter or astringent and which lacks fruitiness. The innermost portion of the woody tissue (xylem) making up the trunk of woody plants, such as grape vines or trees. Heartwood is composed of dead xylem cells which serve to give wood its strength. A measure of the climate of a growing region calculated by adding the mean temperatures for each day (minus a base temperature) over a growing season. For grapes, the base temperature is 50 degrees F (10 degrees C). See Climatic Regions. Unit of size for farmland in Europe and other continents. One hectare is approximately 2.5 acres. (red grape) Vitis.vinifera cultivars developed and recently released by the Weinsberg/Württemberg Wine Research Station, Baden ( Germany ). Has synonym names Weinsberg S 532 and Blauer Weinsberger. Reported as a Fruhburgunder x Schiava Grossa cross. Herb - German equivalent of Brut. The vintner has to administrate the data of the vintage (ripeness, origin, amount) in a so called Herbstbuch ("autumn book"). (red grape) Vitis.vinifera cultivars created and recently released by the Weinsberg/Württemberg Wine Research Station, Baden . Has synonym name Weinsberg S 130. It is derived from a Portugieser x Lemberger cross. On the label may refer to the owner if he is a Duke. Originally an English term to denote wines which came from Hockheim, Germany. Today the term describes the unusually tall, slim bottle which is used for Riesling and similar wines. Also, hock refers to Riesling and similar wines themselves. Taste sensation often found in high alcohol wines. Table wines with hot taste are unpleasant to drink. (white grape) Another crossing by Georg Scheu at Alzey in 1927. Variety made by crossing the Chasselas and the Muscat , which contributes its ubiquitous aroma to wines made from the grape. Grown mostly in the Rheinhessen region and used mainly for sweet white wines of no particular distinction that can qualify for "Auslese" Prädikat standards in better vintages. In viticulture, a new variety resulting from crossing two other (usually very different) varieties. A hollow cylindrical bulb, with lead shot sealed in the bottom to make it float vertically and a numerical scale in the stem for reading the density of the liquid in which it is floated. Hydrometers are commonly used to quickly measure the density (therefore, the sugar content) of grape juice in the fermenter. 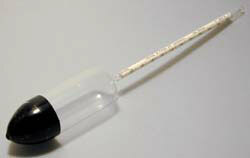 After the juice has become fermented into wine however, the hydrometer can no longer be used for this purpose. While sugar tends to make a water solution more dense, alcohol tends to make it less so. In a mixture of sugar and alcohol, neither one is measured accurately by hydrometry and other, more specific methods must be used.